Definition of Potlatch: What is Potlatch? A Potlatch is an opulent ceremonial feast to celebrate an important event held by tribes of Northwest Indians of North America. A Potlatch is characterized by a ceremony in which possessions are given away, or destroyed, to display wealth, generosity and enhance prestige. The term 'Potlatch' has been corrupted from a Nootka Indian word meaning "gift". The Nootka, now referred to by the name Nuu-chah-nulth, are one of the Indigenous peoples of the Pacific Northwest Coast of Canada. Many other tribes, especially among the Plains Indians, have traditionally practiced some form of potlatch, or give-away ceremonies and customs, highlighted by the lavish distribution of goods and food to tribe members of those of other clans, villages, or tribes. The concept of the Potlatch custom is difficult to comprehend by those who do not share the culture and beliefs of Native American Indians. The early European settlers found the custom impossible to comprehend, they literally came from different worlds and the idea of giving away possessions was a totally alien concept, in fact it still is. The beliefs of the people and the reasons behind the concept of the Potlatch need to be considered to enable a clearer understanding of this custom. The Potlatch was the basis of a Gift Economy as opposed to a a barter economy or a market economy. The gift economy was developed under the auspices of the Potlatch ceremony in which voluntary and recurring gift exchange circulates and redistributes wealth throughout a community building collective ties and obligations. High ranking chiefs possessed numerous titles, prerogatives, rights and privileges, and held many potlatch ceremonies. 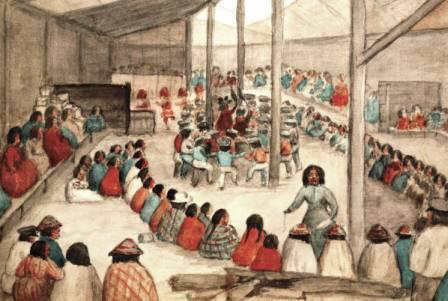 During a potlatch ceremony, the social status of the host was elevated and many of his rights and privileges were transferred, often to children. The guests who attended a Potlatch feast publicly witnessed and confirmed the validity of the new changes in status. The beliefs and customs of the Native American tribes who practised Potlatch ceremonies and rituals was based upon a sense of communal responsibility and the democratic beliefs of the tribes. This was characterized by social equality and a demonstration of the legitimacy of the men who were elected as tribal leaders. A man elected to a leadership position was given the stewardship, rather than ownership, of the wealth of a tribe. He was also expected to give away his possessions so as not to be able to profit materially from his new position. The basic concept and ideals of Potlatch prevented corruption in high places of trust and power. A Potlatch ceremony also provided recognition of new social status within the tribe. A Potlatch ceremony included a feast, singing, dancing with costumed and masked dancers. Some potlatches took a year to plan and lasted as long as three weeks. There were other reasons for a Potlatch ceremony besides those designed to celebrate and acknowledge an elevated status within the tribe. Each person invited to a Potlatch received gifts related to their social rank. The more wealth that a family gave away, the more prestige was bestowed on them. In some tribes the distribution of property and gifts by an individual was returned by guests who made equivalent gifts, with interest, in return. In other tribes it was a custom to destroy personal property in another show of wealth. Those who gave away or destroyed the most property earned the greatest social prestige.